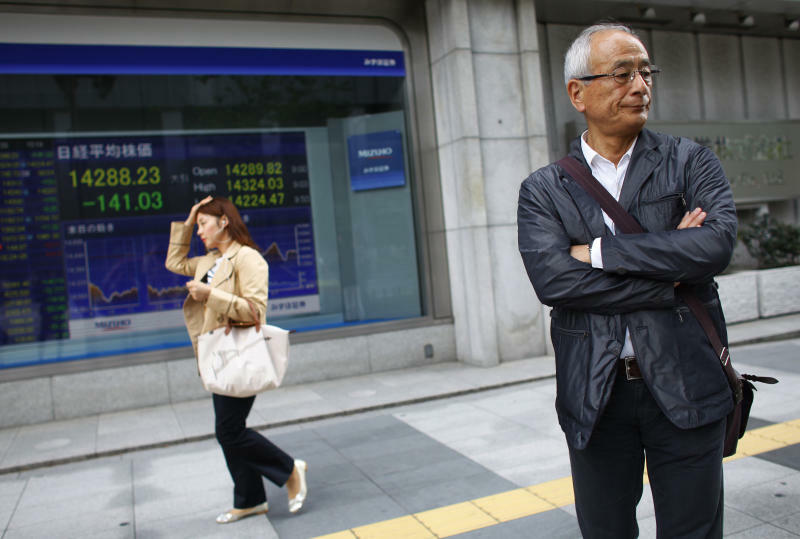 TOKYO (AP) -- Financial markets were mixed Monday, pushed higher in Europe by recent merger and acquisition activity, though Asian investors were wary of deepening troubles in Ukraine and financial indicators due later in the week. Britain's FTSE 100 gained 0.3 percent to 6,711.11 in early trading, while Germany's DAX climbed 0.6 percent to 6,711.11. France's CAC also added 0.6 percent, to 4,468.76. U.S. shares looked set to rebound from sharp losses last Friday. Dow Jones industrials futures were up 0.4 percent and S&P futures gained 0.3 percent. The U.S. was preparing to levy fresh sanctions against Russia for Moscow's failure to uphold terms of an agreement with the U.S., the European Union and Ukraine that calls for Moscow to withdraw Russian forces from the border with Ukraine and encourage pro-Russian separatists to turn over buildings they're occupying in eastern Ukraine. Meanwhile, pro-Russian militants turned to kidnapping, taking dozens hostage, including journalists, pro-Ukraine activists and European military observers. "The Ukrainian tensions are once again mounting and the word coming from Capitol Hill and also Europe is that sanctions on Russian officials will be harder, more direct and onerous on President Putin's inner circle; this will disrupt normal trading conditions," Melbourne, Australia-based, IG market strategic Evan Lucas said in a trading note. Worried investors have been shifting from riskier assets into traditional havens like bonds, gold and mainstay equities like utilities, sapping markets of their earlier upward momentum. Adding to the geopolitical uncertainties is a slew of end-of-month data due this week from Japan, the U.S. and China. Oil gained 74 cents to $101.34 in electronic trading on the New York Mercantile Exchange amid concern about the potential impact of additional sanctions on Russia's energy exports. In Asia, Japan's benchmark Nikkei 225 stock index fell 1 percent to 14,288.23, while Hong Kong's Hang Seng Index lost 0.4 percent at 22,132.53, and South Korea's Kospi gave up early gains to edge 0.1 percent lower to 1,969.26. Shares in New Zealand, China, India and Singapore fell, while shares rose in Taiwan and Australia. In other markets, the euro was trading at $1.3867, compared with Friday's close of $1.3834. The Japanese yen was almost unchanged at 102.23 yen to the dollar, compared with 102.15 late Friday.